Dave Challinor hopes his AFC Fylde team will reap the rewards of James Hardy’s unforgettable week when they welcome Boston United to Mill Farm tomorrow. Hardy made his international bow for England C in Estonia on Tuesday, setting up both goals to help his country win through to next year’s International Challenge Trophy final in Slovakia with a 2-1 win. 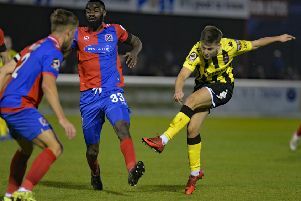 The attacker was back in training with league leaders Fylde yesterday and has been challenged to keep up the good work against tomorrow’s Lincolnshire visitors. Challinor said: “Representing his country was a new experience for James and one that can only benefit him in terms of his confidence. With Blackpool loanee Macauley Wilson also back in training yesterday after illness earlier in the week, Challinor will have a fully fit squad to select from this weekend bar Caspar Hughes, who should be available within the next two weeks. With no midweek match, this is the sort of week in which Challinor should most feel the benefits of a full-time squad. However, the manager admitted: “Unluckily our chance to work a bit more coincided with the weather taking a turn for the worse, which hasn’t been ideal and we have been scrambling around a bit. Tomorrow’s opponents are used to competing with Fylde in the upper reaches of the league but find themselves 14th after a mixed start. Last weekend Boston challenged Vanarama National North’s team of the moment Brackley, who knocked Gillingham out of the FA Cup to earn a visit to Blackpool in a fortnight. Challinor said: “Boston came back from 3-0 down against Brackley to 3-2 and they missed a penalty. n Fylde have been drawn away at Clitheroe in the quarter-finals of the Partners Foundation Lancashire FA Challenge Trophy. The Coasters, who beat AFC Darwen 6-2 to reach this stage, take on a Clitheroe team that defeated AFC Blackpool 4-2. Draw: Daisy Hill v Chorley; Radcliffe Borough v West Didsbury & Chorlton or Padiham; Ashton Athletic v Atherton Laburnum Rovers; Clitheroe vs AFC Fylde. The ties will be played in the week beginning December 5.
n Luke Swindlehurst has left his post as manager of Fylde Ladies to pursue a new role in the game.